The WeatherHYDE is a life-saving shelter designed by billionBricks. 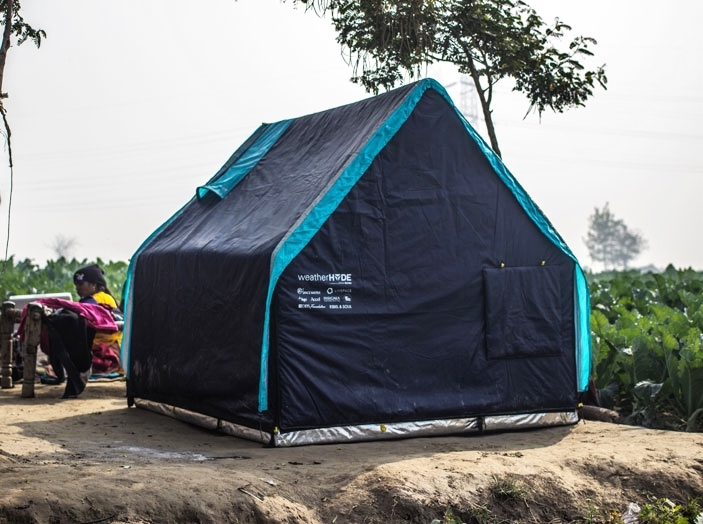 It protects the vulnerable from extreme weather and offers women and children privacy and a safe space. The Singapore-based non-profit design studio, Billion Bricks, uses design as its primary tool to solve one of the most pressing global problems: homelessness. The WeatherHYDE, which Billion Bricks claims is the world's first reversible all-season family tent, was erected at the Building Research Park last week. The shelter measures 1.5 x 1.8 m and its maximum height is 1.6 m. Total weight is 12 kg. The design includes a reversible canopy of triple layers with insulation. The WeatherHYDE is also a reversible tent, with the foil faced to the outside in hot climates.